It’s that time of the year when baking and making turns to Christmas. It’s that time of year when the preserving pan comes out and I turn some of the produce from the allotment and elsewhere into preserves: jams, chutneys, jellies, and pickles. I made some pumpkin and ginger jam (which always turns out more like a marmalade) and a first for me, quince jelly. For both of these I made videos of the process. You can watch these below. I had a gift of a bag full of cooking apples at the weekend, and made a couple of different things. First an apple crumble, and then also a Dorset Apple Cake. I recorded the apple cake production (see below). I’m also planning to make something called Friar’s Omelette, which is nothing like an omelette, but another cake, before I can do that I need to top up some ingredients. We had a little rain overnight on Friday, and a little more on Saturday afternoon. On Sunday we had rain pretty much the entire day. As I sit at my desk writing this it looks like we might get a little more. We needed that Sunday rain more than either of the two previous showers, which hardly made the soil damp, but even so the ground isn’t wet, and our garden pond is still a long way off of being full again. We’d been having problems with flies over the last few days. There were way more getting into the house than is normal, and even with the hot weather it was abnormal. I was pretty sure that this meant something had died somewhere and the life cycle of death was taking place. If you look this up on the internet you find that there is a sequence that takes a few days and manifests first as blowflies (you’ll probably think of them as “Greenbottles”), and then the aptly named flesh flies. I reached the point yesterday where I’d had enough. The majority of flies seemed to be in the lounge and so I shut myself in there and spent 20 mins trying to kill every fly in the room. I was pretty sure that I’d gotten them all so I sat for another half-an-hour looking at the window, where the flies had seemed to be gathering. I was thinking that perhaps they were in the wall cavity, and had found a gap somewhere that they could squeeze through. And then a fly flew over my head, from behind me. I thought it was one that I’d missed from the early genocide, so I dispatched him to join the others. And then another fly flew over my head, from behind me. Even I’m not that inefficient. And then it dawned on me. The chimney. There’s no longer a fireplace there, but the chimney is still there and open to the elements. We’ve had a sparrow fall down before and get caught behind the board that’s in front of the opening to prevent draughts, and we assisted him out. So it made sense that perhaps there was something else that had fallen down and was now decaying behind the board. I cleared everything out of the way and moved the board, and several flies buzzed around my head, but I couldn’t see anything else untoward, until I shone my torch up the flue pipe and there, was a dead wood pigeon, jammed in the flue. 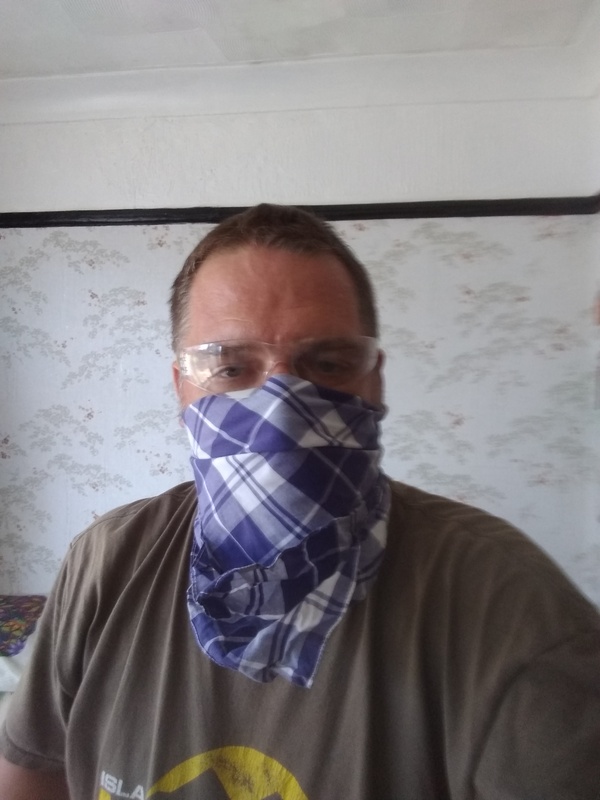 I donned some protective gear (I couldn’t find my dust mask, so had to go a bit wild west), and with a bin liner in one hand , carefully positioned beneath the flue, I reached up with the other hand and dislodged the pigeon. In the end it wasn’t a difficult job, and there wasn’t too much mess to clear up, even though the pigeon had done a pretty good job of sweeping the chimney on his way down. It’s also cleared up the fly problem almost instantaneously. RIP Percy Pigeon, I’m not sure how you came to fall down the chimney in the first place, and I’m not sorry to see you removed from your temporary resting place, but I am grateful you’ve taken all your winged companions with you. The tomatoes in the potting shed are starting to ripen, it’s only been 7 1/2 weeks since they were planted out and they’re good to be eaten.